San Antonio's Girl In A Coma have left a permanent tattoo on the hearts of music lovers with their piercing songs and nuclear performances. They've blazed a singular trail since Nina Diaz joined the band at age 13 and have found champions and comrades along the way including Joan Jett who signed them, Morrissey, Sia, Tegan and Sara, The Pogues and Amanda Palmer who have hand selected them for tours. In addition, Robert Rodriguez asked them to compose one of the key songs for his film Machete. All the while, they have been building one of the most impassioned and diverse fan bases in music. Girl in a Coma are that rare feral band, unaffected by trends, that has managed to stay wild and thrill us at every turn. Their most recent album, Exits & All the Rest, was released in late 2011 on Blackheart Records, and is the most heart-stopping turn yet. The album was named to NPR's list of Top 50 Albums of 2011 and won the IMA award for Best Indie/Alt Rock Album. Girl in a Coma formed when best friends Jenn Alva and Phanie Diaz met in junior high school art class over a mutual love of the Smiths, Nirvana, and skipping school. All they needed was a singer. Enter Nina Diaz, Phanie's little sister. Nina blew them away with her mesmerizing vocals, a powerful voice some critics have compared to Bjork, Patsy Cline, and the band’s hero, Morrissey himself. The trio practiced for three years, gigged at local punk rock clubs, played a High School talent show, one kid's birthday party, and then hit the road, building up a solid and loyal fan base across the country. 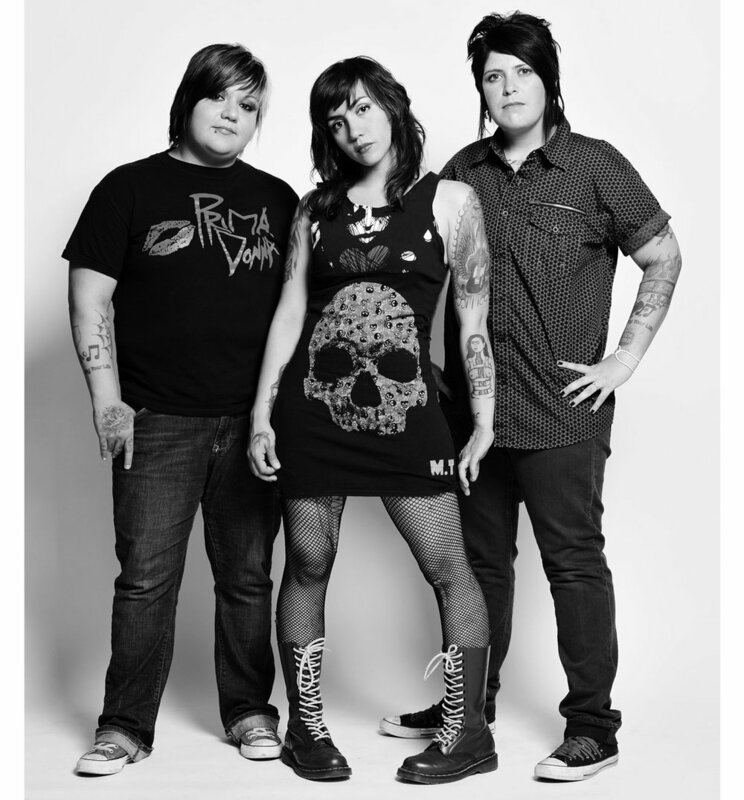 In 2006, the Girls played for Joan Jett and long-time songwriting partner and producer, Kenny Laguna, at New York's Knitting Factory as part of a cable TV show featuring unknown bands. Jett and Laguna were so impressed with the band that they signed GIAC to their label, Blackheart Records, on the spot. The band's 2007 debut album, Both Before I'm Gone, was a critical hit with raves from Alternative Press Magazine, the LA Weekly, Bust magazine, among many others, with the album reaching No. 23 on Billboard's Heatseekers chart and No. 21 on iTunes. "Clumsy Sky," the band's first single, won a 2007 Independent Music Award. In 2009, the band released their follow up album, Trio B.C. The album is a unique amalgamation of eclectic influences: oldies, rockabilly, 90s alternative, and contemporary bands both indie and mainstream. Just a year later, the band recorded a companion piece to Trio B.C. Produced by Grammy-award winning producer Greg Collins (U2 and Gwen Stefani), Adventures in Coverland features reinterpretations of songs and artists who have impacted the band. The songs range from a punked out version of Selena's "Si Una Vez" to a stripped down version of Joy Division's "Transmission." In early 2011, new material was piling up and the band was ready to head back into the studio to work on their upcoming album, Exits & All the Rest. From sharing stages with their heroes to experiencing Arizona's controversial laws firsthand, the album was born in an especially intense period for the band. The Girls headed a few miles north to Austin and recorded with producer Mike McCarthy (Spoon, Trail of Dead). It was the band’s first time working on analog tape and all the basic tracks were laid down live. The recording process seemed to help the band capture some of the raw energy and power that they are known for in their live shows. At the same time, the album showcases the depth and maturity of Girl in a Coma's songwriting. Album opener "Adjust" is a tale of persecution and a sonic minefield. Nina Diaz's voice turns from a lament to a growl in a split second while the thundering combination of Phanie Diaz's drums and Jennifer Alva's bass rattle your ribcage. "One Eyed Fool" is a fearless and bare declaration of the universal need to be loved. "Cemetery Baby" underscores the bands ability to seduce you with melody no matter how tragic the message. "Hope" is a pogo ready punk assault that speaks to the Arizona immigration dispute while daring you to stay still. "Smart" showcases GIAC's own special recipe for a melodic pop song. The stomping rhythm of future GIAC anthem "Control" lays a foundation for Nina’s voice to build empires of heartbreak on. The album closes with the dramatic build of "Sly" and raw emotion of "Mother’s Lullaby." The stamp San Antonio's music scene has left on the band is all over the album and its stabs of punk, tejano, rockabilly, classic rock and roll, rancheras, indie rock and ballads all contributing to a sound that can only be described as Girl in a Coma.